by Stephen M. Feldman. New York: New York University Press, 2012. 240 pp. Cloth $45.00. ISBN: 978-0-8147-6466-4. In Neoconservative Politics and the Supreme Court, Stephen Feldman explores the history and impact of neoconservative ideology – a label that is often used in American politics, but is seldom fully understood. This book is an important contribution to a growing body of scholarship exploring the growth and success of the conservative legal movement in America. Feldman seeks to answer two broad questions in this book: what is a neoconservative, and what impact has neoconservative ideology had on the Supreme Court? He takes up the first question in chapters 2-4. Here Feldman explains that “neoconservative” is not simply a catch-all term for anyone on the “far right,” but a political philosophy with a distinct and historically developed meaning. The second question is taken up in chapters 5-6. Here Feldman analyzes a number of court cases, and attempts to measure the impact of neoconservative thought on modern Supreme Court jurisprudence. Throughout the book, Feldman argues that neoconservatives are motivated by a critique of pluralist democracy and a desire to return to the republican democratic principles of the founding generation. In chapter 2, he provides a historical analysis of the decline of republican democratic principles, and the rise of pluralist democracy. Republicanism is based on the idea that political decisions should be made for the “common good,” while pluralism celebrates the pursuit of individual self interests. Neoconservatives argue that the shift away from republican democratic principles occurred as a result of an aggressive ideological push by Franklin Roosevelt and his New Deal Coalition. Feldman argues though that the real cause of this shift was not ideological, but the product of structural changes in the American polity. Factors such as industrialization, urbanization, and immigration all led to the development of a heterogeneous population with no common interest to pursue. This led to the adoption of interest group politics which culminated with FDR’s New Deal Coalition. Chapter 3 explores a second major element of neoconservative thought, the critique of moral relativism. Feldman begins the chapter with an overview of the works of Leo Strauss, who he argues provides the roots of neoconservative political ideology. Strauss, writing in the aftermath of WWII, offers a biting critique of pluralist democracy and moral relativism. He criticizes the fact-value distinction which argues that while we can use facts and reason to discover answers to empirical questions, values are issues which have no right or wrong answers. Instead Strauss believes that there must be some moral absolutes to guide us. For neoconservatives, these [*224] ideas would lead to the condemnation of “morally bankrupt” systems of Fascism and Communism, strong support for Democracy as the best form of government, and support for traditional values as a mechanism for creating responsible citizens. 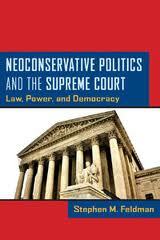 Chapter 4 provides a detailed discussion of the rise of neoconservative thought and its impact on American politics. The first half of the chapter explores the emergence of neoconservatism during the 1960s as a reaction to the anti-war and counter-culture movements. Neoconservatives opposed these movements, which they believed undermined “American values,” because they expressed support for moral relativism and offered biting critiques of the wisdom of promoting American-style Democracy abroad. Neoconservatives also voiced opposition to welfare and affirmative action policies, which they argued undermined core values of hard work and self reliance. In foreign policy, they embraced anti-Communism, and after the fall of the Soviet Union, supported the use of military intervention to promote Democracy and bring about regime change abroad. In the second half of this chapter, Feldman turns his attention to neoconservative constitutional theory. Neoconservative legal theorists such as Robert Bork expressed a clear desire to return to a pre-1937 interpretation of the Constitution – what many neoconservatives call the “Constitution in exile.” Bork advocated a theory of constitutional interpretation based on “originalism,” which had obvious appeal for neoconservatives. According to them, a focus on original intent allows jurists to avoid the temptation of reading their own values into the Constitution, and instead encourages a return to the republican values of the founders. Originalism also provides a nice alternative to the relativism of the left, rejecting a case-by-case approach to constitutional law, and instead creating clear standards which can guide judicial decision-making in all cases. Towards the end of chapter 4, Feldman offers a bit of a critique of the neoconservative approach. He points out that while neoconservatives preach a return to the republican democratic principles of the founding, the problem with this approach is that society has changed dramatically since then. Republican values may fit well in a largely homogenous agrarian society, but are not well suited to life in a modern, heterogeneous society with an industrial economy where “common interests” no longer exist. Neoconservatives seem to ignore this problem, which leaves them advocating for a concept of Democracy that no longer fits in the modern world, and makes the practicality of returning to the Constitution of 1937 dubious at best. Overall, I think the detailed analysis of neoconservative ideology that Feldman conducts in these three chapters is compelling and insightful. The reader comes away from this analysis with a much richer understanding of neoconservativism and its impact on American politics. That said, it might have been interesting to see Feldman offer more critical analysis of the conservative romanticization of the founding period. Neoconservatives seem to assume that politics were fundamentally different during the [*225] founding period than they are now, and it seems that Feldman largely accepts this assumption. But is 1937 really the turning-point that neoconservatives seem to think it is? Pluralism is, after all, a theory that is based in no small part on the insights provided by James Madison in Federalist 10, and would not seem to be fundamentally incompatible with promoting the common good. Neoconservatives clearly believe that the New Deal policies of FDR changed America from a country that valued the common good to one which favored special interests. But New Dealers would no doubt disagree with this interpretation. For them, the New Deal was not about embracing special interests, but embracing a different interpretation of the common good, one which saw an expanded role for government as necessary for controlling the special interests of corporations. In the final two chapters of the book Feldman turns his attention to measuring the impact of neoconservative ideology on the Supreme Court. In Chapter 5, Feldman argues that a solid block of neoconservative jurists including: Scalia, Thomas, Rehnquist, Alito, and Roberts, along with moderates Kennedy and, to a lesser extent, O’Connor, have been able to influence Supreme Court jurisprudence in a number of areas. As evidence of this, he offers a detailed analysis of cases dealing with a variety of issues, including interstate commerce, equal protection, free expression, and religious establishment. In each of these areas, Feldman shows how the neoconservative majority has won key victories: rolling back commerce power, instituting a “colorblind” conception of the Constitution, allowing for the suppression of “dangerous” or “undesirable” speech, and reducing the separation between church and state. He ends the chapter by examining three counterfactual cases: Lawrence v. Texas (2003), Hamdan v. Rumsfeld (2006), and Citizens United v. FEC (2010). In each of these cases, Feldman explains how some combination of unique factors led to a lessening of the neoconservative impact. In chapter 6, Feldman concludes his analysis by arguing that neoconservatives will continue to exert considerable influence on the Supreme Court, and will increasingly come into conflict with progressives in the Presidency and Congress. Feldman suggests that Kennedy will remain a key vote, and that progressives should aim to please him when arguing before the court should they have to do so – a reasonable, if somewhat obvious, suggestion. While I think this book is very successful at achieving its goal of explaining the origins and content of neoconservative ideology, it is somewhat less successful at explaining the impact of neoconservatism on the Supreme Court. Feldman begins the book by declaring that, “neoconservatives will be steering the Court for the foreseeable future” (p. 3). This is a bold statement – one that I am not convinced is supported by the evidence provided here. While neoconservatives have had some victories, the big wins have continued to elude them. This is because they have never had anywhere near a majority on the Court. Rehnquist, Scalia, and Thomas were all reliable neoconservative voices who expressed support for the concept of a Constitution [*226] in exile. But the Rehnquist Court was not shaped by these voices, it was shaped by the moderates O’Connor and Kennedy, who wrote most of the landmark decisions handed down during this time because they could build coalitions with the other justices, while the more extreme neoconservatives could not. Today it seems we are in a similar situation with Rehnquist being replaced by Alito as a reliably neoconservative vote. Feldman categorizes Roberts as a neoconservative as well, but that seems to be a bit of a stretch, particularly given his defection in the Sebelius case (a decision which, to be fair, was handed down after the book went to press). Instead of writing triumphant majority opinions, neoconservatives such as Scalia and Thomas have most often had to settle for caustic dissents and concurrences. This is a trend that seems to be likely to continue in the future. Overall, this book is very well written with arguments that are presented in a clear and coherent manner. It makes a number of important contributions to our current understanding of conservative ideology and Supreme Court jurisprudence. Feldman does an excellent job of taking conservative thought seriously, and working to provide a fair analysis of neoconservative ideology without editorializing. He is careful to distinguish “neoconservatives” from other camps within conservative political ideology, including “paleo-conservatives,” “traditionalists,” and “libertarians.” This is important, because conservative thought is so often presented as a monolith in modern American politics. While such a characterization may have made some sense in the 1980s when Ronald Reagan was able to unify the disparate elements of the Republican Party under one tent, today the movement is deeply divided; it behooves us to recognize and explore these divisions. The book is clearly written for a scholarly audience— Feldman has command of this material, and provides plenty of notes and case facts to back up his arguments— but the arguments are presented in an accessible and easy to follow manner. This work would be of interest to anyone who wants to know more about conservative thought and Supreme Court jurisprudence including specialists and non-specialists alike. Citizens United v. FEC 558 U.S. 310 (2010). Hamdan v. Rumsfeld 548 U.S. 557 (2006). National Federation of Independent Business v. Sebelius 567 U.S. ____ (2012). Copyright 2013 by the Author, Joseph Mello.